"The highest-grade of the Japanese precious wood, black persimmon"
The black persimmon appearing at the rate of one of tens of thousands in the persimmon tree is a very precious tree. The black witch painted a sumi has courtliness. It comes out to a totally different pattern by point of the wood to use. It is the glasses which are tasteful almost as same as tortoiseshell. "Turns from roadside trees into glasses, cherry tree"
There is a grand avenue of Yoshino cherry tree in Tokyo-Kunitachi. I met the group which kept the cherry tree in good condition in Kunitachi of the neighborhood station. If environment is bad, the core of the Yoshino cherry tree rots. The tree must prune it. Because the life of the Yoshino cherry tree is 80 and is short for the tree., in late years pruning work is pushed forward. The pruned wood is changed into the bench of the town by a maintenance group. 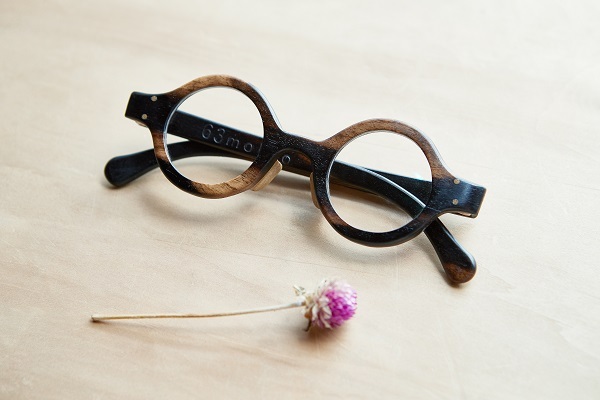 63mokko gets those woods and ascertains the point that is most suitable for glasses and produces it. I change a Yoshino cherry tree that a color turns beautiful densely with time into the new form called glasses. and leave it forever.